Tripp Lite U222-004 is an inexpensive way to expand the number of available computer USB ports. It's compact design with built-in cable is perfect for travel, fitting easily into a laptop bag pocket. Supports USB 2.0 data transfer rates up to 480 Mbps and is backward compatible with USB 1.1. Bus powered through the computers USB port... no external power required, but includes a Micro B port for an additional connection to the computer in case more power is needed. 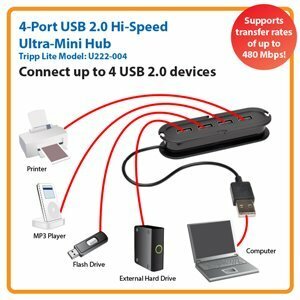 Connect the U222-004 to your computer and you’ve got 4 downstream ports for fast, efficient data transfers at speeds up to 480 Mbps. And the U222-004 is backward compatible with USB 1.1 devices, which means you can keep using older peripherals while getting maximum high-speed performance from new devices. This makes the U222-004 ideal for a wide range of USB devices, including flash drives, external hard drives, external DVD players, MP3 players and digital cameras. The U222-004 is designed to work with both desktop computer setups and portable notebook computers. It’s small and light enough to fit in a briefcase or notebook case—giving you the convenience of multiple USB ports no matter where life takes you. The U222-004 provides plug-and-play convenience, with no special software or complicated setup procedures required. The U222-004 also features hot-swappable functionality, allowing you to add or remove a device at any time without powering down the computer. The U222-004 is bus powered via the computer’s USB port, and for most applications no external power is required. It has a Micro-USB B (female) port for an additional connection to your computer if more power is needed. With its superior design and construction, the U222-004 is ideal for multimedia and other high-end applications that require fast, clear transmission that is free of line noise and other interference. It meets or exceeds USB 2.0 specifications for high-speed (up to 480 Mbps) data transfer and is backward compatible with USB 1.1 applications. The U222-004 is compatible with Windows® 98, Windows 98 SE, Windows 2000, Windows ME, Windows XP, Windows Vista, Windows 7 and Mac OS 8.6 or higher. It connects desktop and notebook computers equipped with a USB A (female) port to USB peripheral devices equipped with a USB A (male) connector. The U222-004 is compatible with both USB 2.0 and USB 1.1 applications. The U222-004 is manufactured in compliance with strict RoHS specifications, reflecting Tripp Lite’s commitment to environmental responsibility. For peace of mind, it comes backed by a three-year warranty.